One of the highly admired garments for Islamic men is Jubba. People in Islamic countries wear ankle-length garment, with long sleeves which is similar to a robe. 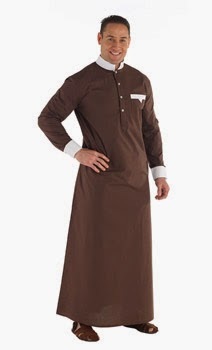 Generally this one-piece Islamic clothing for men is worn as an upper garment and the Jubba is a traditional Muslim wear. However, with the changing fashion and time, today, various styles of Jubbas are available in the market. Besides styles, this traditional piece has undergone various designs in order to offer a trendy wear to the men. Though Jubba is now available in trendy designs, traditional form remains the same. Moreover, traditional Jubbas were only made with cotton fabric, white colour, long and loose. Nonetheless, these days’ Jubbas are available in different types of materials, such as cotton-mix, silk, rayon, polyester and wool. Besides, Jubbas are also found in synthetic blends for a wrinkle-free and easy-to-wash option. These Jubbas can also be availed in varied styles and colours as the traditional one has been replaced by black, beige, grey, brown, blue and navy blue colours, among others. Along with religious occasions, these are worn for a variety of formal functions, special occasions and as a regular wear. For special occasions, Jubbas are available with embroidery and sequins work in both bright and light colours. The plain looking Jubbas are highlighted with pockets, zippers, buttons and piping in order to give it a formal look. Though the traditional Jubbas were only loose-fitting garments, these days Jubbas can be customised and tailor-made as per the requirement of the wearer. Also, these are available in body fitted robe. Rounded neck Jubbas, collared Jubbas, polo neck, hooded, half sleeves and various other types of Jubbas can be found in the market. If you are worried about getting stylish Jubbas, then don’t worry. You can simply opt for online shopping as a wide-variety of Jubbas, along with other Islamic clothing for men, is available on the shopping websites. You can read about the material, see the colour and get all the details before ordering one. These websites make sure to offer you different ranges of Jubbas to suit all the occasions. Jubbas are also available for older people and kids. Moreover, you need not to worry about the payment, as you can simply use safe payment gateway or cash on delivery option. So, don’t stick to your boring clothing, instead go for some modernisation with tradition. These Jubbas are a perfect blend of tradition, style and a lot of variations. Visit EastEssence.com for more information.